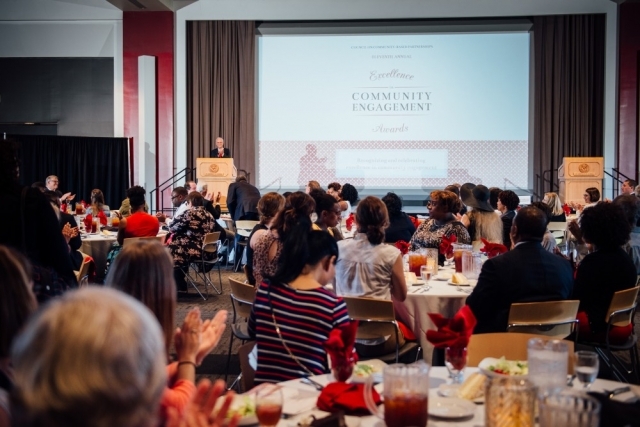 For the 11th consecutive year, The University of Alabama honored the campus and community’s best examples of engagement scholarship and recognized other community-related activities at the Council on Community-Based Partnership’s annual awards ceremony Friday, April 14 in the Bryant Conference Center’s Sellers Auditorium. 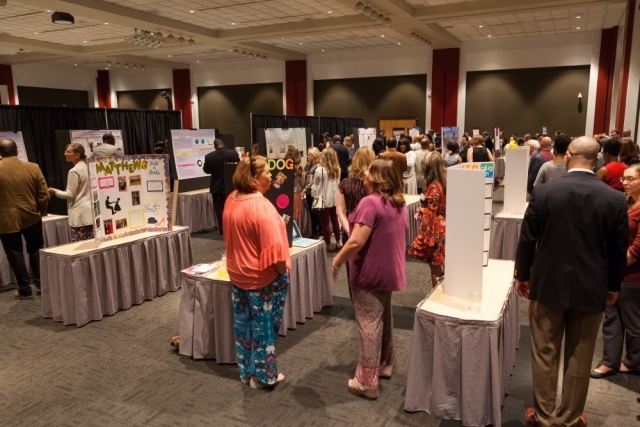 As noted by several speakers and by the quality of the projects being recognized, engagement scholarship has made rapid advancements and improvements on the UA campus over these past 11 years. Engagement scholarship at The University of Alabama, combines the traditions and mission of teaching, research and service in equitable partnerships with communities external to the campus. 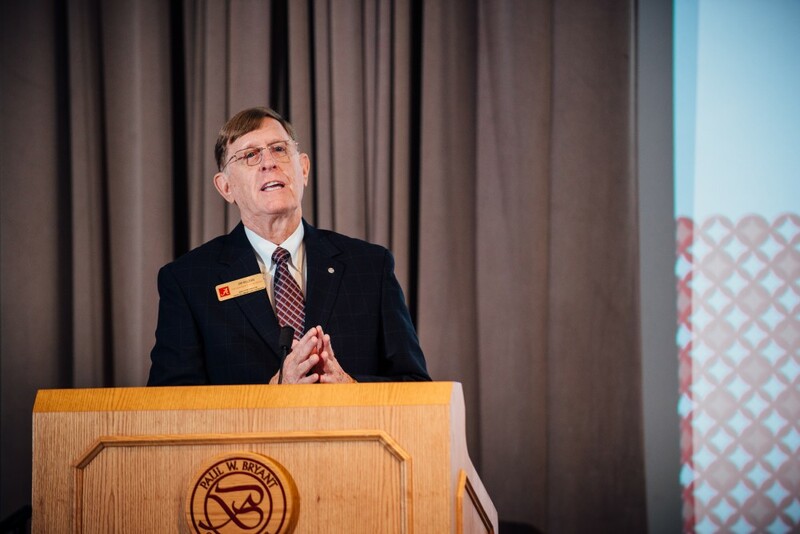 “Today we honor those who conduct research in a very special way,” said Dr. James E. McLean, executive director of the Center for Community-Based Partnerships (CCBP). With about 200 people looking on, dozens of faculty, staff, students and community members were recognized for their contributions. 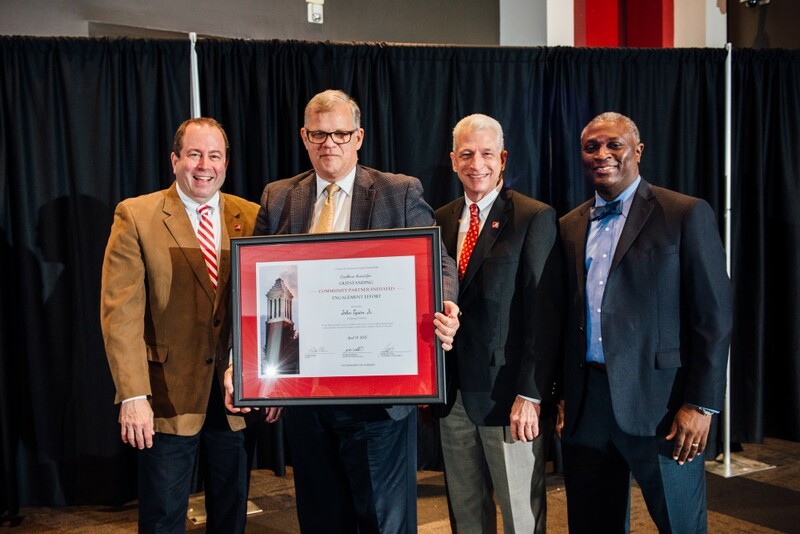 Receiving the Outstanding Special Achievement in Community Engagement Award was Dr. Carl A. Pinkert, vice president for the Division of Research and Economic Development. 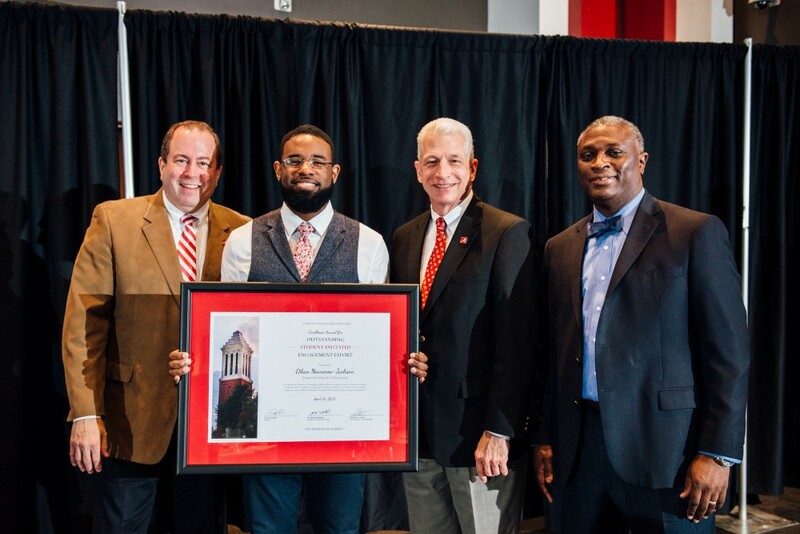 In presenting the award, Dr. Samory T. Pruitt, vice president for the Division of Community Affairs, thanked Dr. Pinkert for his support of CCBP, especially in the area of seed funding and other research support. “He has not only helped us secure funds but he has also funded some projects from his own budget,” Pruitt said. Pinkert became vice president of the division in 2013 and has presided over the expansion of UA as a research university. Pinkert received his doctorate from the University of Georgia and has served as a research professor in such institutions as UAB and University of Rochester. 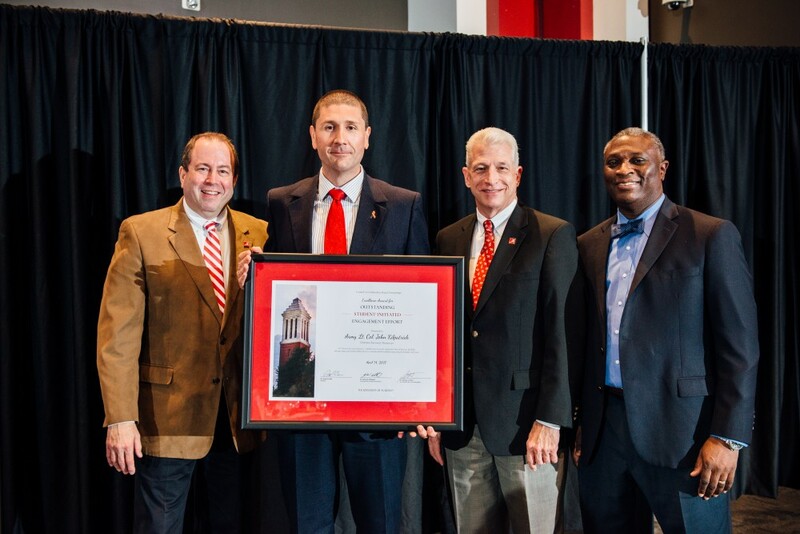 Pruitt praised him for raising the campus-wide profile of the University’s research and grants activities. 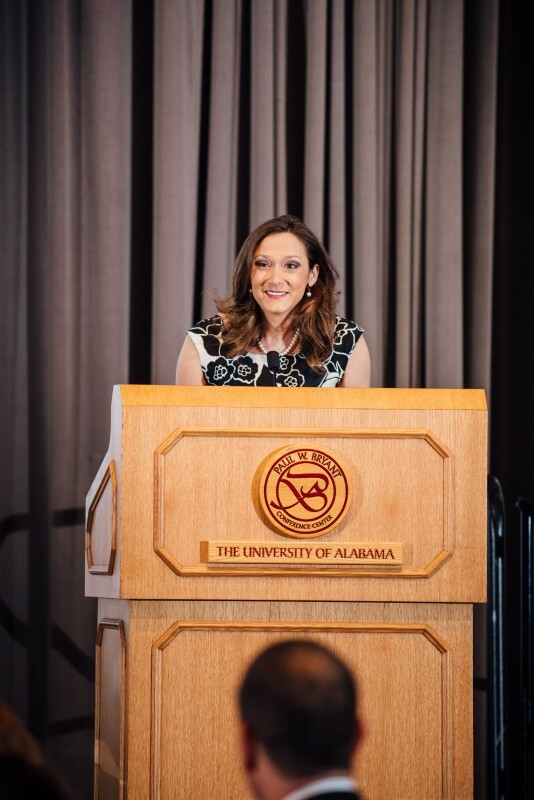 The scholarship is named for Zachary David Dodson, who embodied the best of what engagement scholarship means at UA. Much like this year’s winner, Dodson was involved in most of CCBP’s programs. He died in 2012 on the day he was to have received his University of Alabama degree in economics. 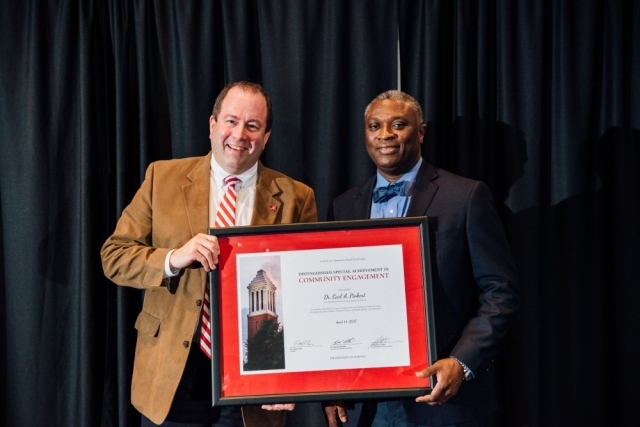 Dr. Billy Kirkpatrick, executive director of West Alabama AIDS Outreach, is this year’s Distinguished Community-Engagement Scholar in the community partner category. 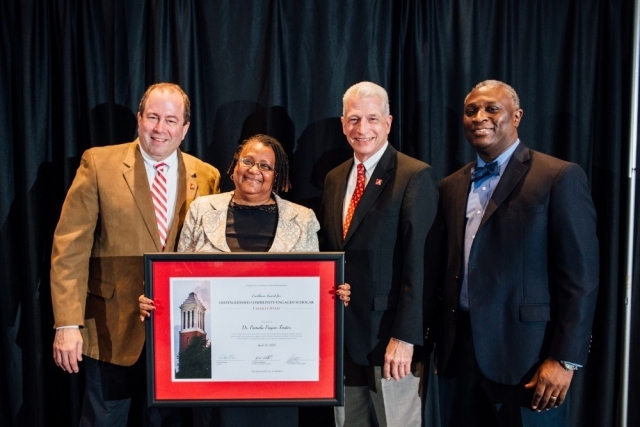 Kirkpatrick’s work helps to reduce the stigma of the disease among HIV/AIDS patients. 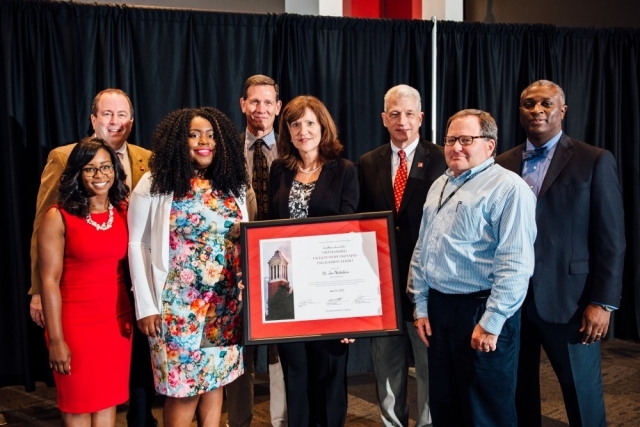 Outstanding Faculty-Initiated Engagement Effort — Dr. Jen Nickelson, associate professor of health science; Dr. Kagendo Mutua, professor of special education and multiple abilities; and Dr. David L. Albright, associate professor of social work. 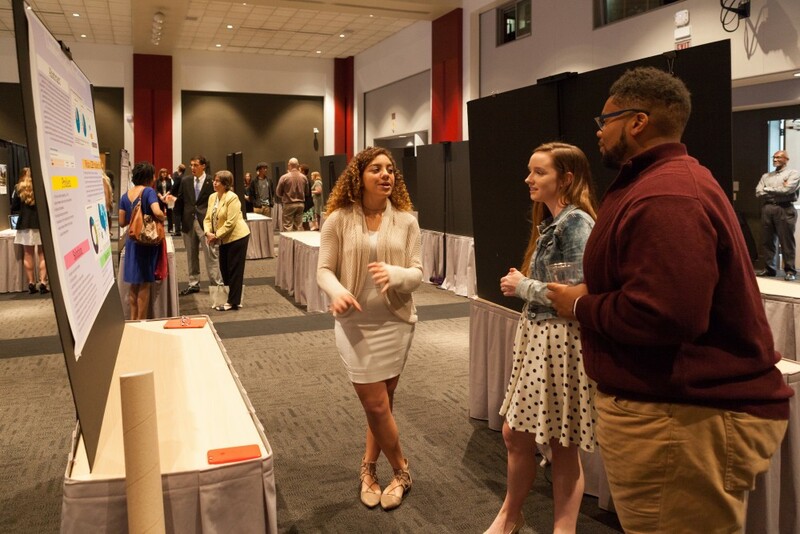 Outstanding Student-Initiated Engagement Effort — Allyson Mitchell, undergraduate student in communicative disorders; Army Lt. Col. John Kilpatrick, social work master’s student; and Ethan Newsome-Jackson, engineering undergraduate student. 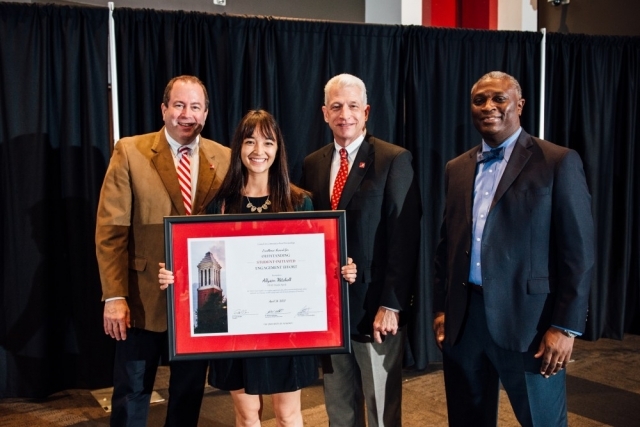 Outstanding Community Partner-Initiated Engagement Effort — Qiaoli Liang of the Chinese Sisterhood program; Dr. Billy Kirkpatrick, executive director of West Alabama AIDS Outreach; and John Tyson Jr., retired Mobile county district attorney. 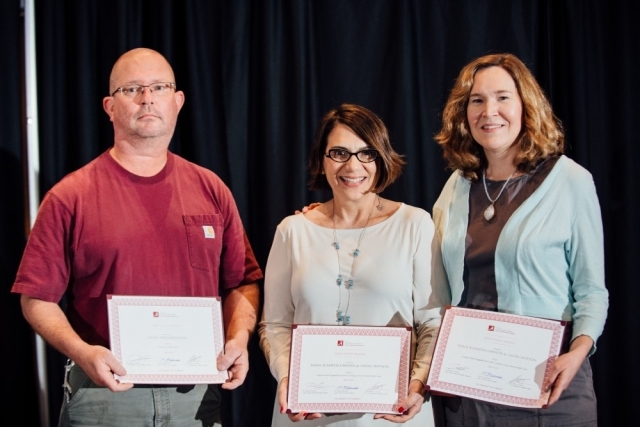 Winners of this year’s $5,000 research seed funds were Dr. Tania Alameda-Lawson and Dr. Laura Hopson, both from the School of Social Work, for their project Collective Parent Engagement and Service Learning at Davis-Emerson Middle School; and Craig Wedderspoon, of the art and art history department, for his project Growing Art. Named to receive travel funds to support community engagement research and scholarship were Brenna Sweetman, geography department, to present her work for the Water Conservation and Effective Watershed Management project in Punta Gorda, Belize; Dr. Kevin Andrew Richards and Victoria Shiver, both in the department of kinesiology, to present their project, The Development of an After-School Program for Youth Placed At-Risk: A Collaborative Approach, in Savannah, Georgia; Douglas Craddock Jr., doctoral student in higher education administration, to present his project, From Greensboro to Greensboro, Contrasting Two Community Partnerships to Propel Men of Color to Success, in Greensboro, North Carolina; Calia Torres, doctoral student in psychology, to present her project, Reducing Disparities with Literacy-Adapted Psychosocial Treatments for Chronic Pain: The Effect of the Lamp Intervention on Patients’ Pain and Psychosocial Functioning, in Pittsburgh, Pennsylvania; and Dr. Safiya George, associate professor in the Capstone College of Nursing, to present her project, Telemedicine Perceptions of Rural Patients With HIV and Mental Health Issues, in Paris, France. Three fellowship awards were provided through the Graduate School available in the 2017–2018 funding cycle. 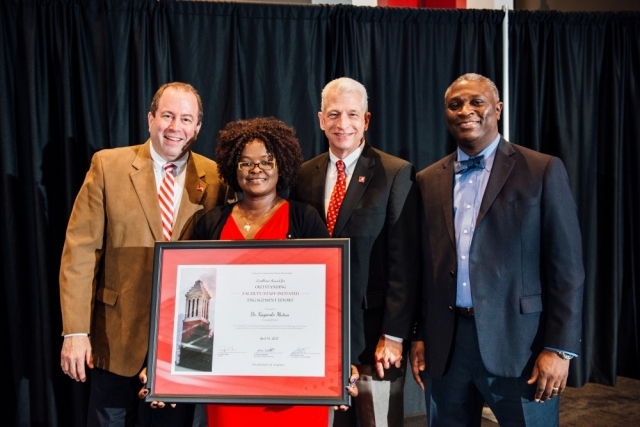 They carry a $15,000 stipend payable over fall and spring semesters, a full tuition grant for both semesters and a healthcare stipend. 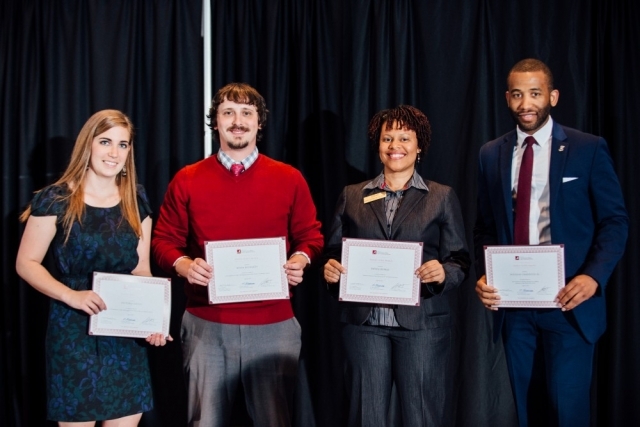 The recipients were Matthew Price, doctoral student in civil, construction and environmental engineering; Kelsey Ann Dyer, master’s student in special education and multiple abilities; and Margaret L. Holloway, doctoral student in English. Dr. Pruitt provided closing remarks. “We’ve had a great day today and I am so proud of all of those who were honored today and all of those who make this event possible,” he said. Parent Teacher Leadership Academy participants Brittany Harris, Samara Early and Nakami Townsell, Shh…Don’t BUG us, We are Reading! Dr. Jen Nickelson, associate professor in the Department of Health Science, and students Dashauna Ballard and Kristen Allen, Building Trust Among Community Partners by Understanding Their History.Dr. Peter Hlebowitsh, dean of the College of Education, is chair of the Council on Community-Based Partnerships, a 150-member community-based research leadership organization with membership composed of community members and faculty, staff and students representative of all academic divisions of campus.